After months of rumors, hype, teasers, and bogus leaks, Daft Punk have finally released something from theTron: Legacy soundtrack that we can sink our teeth into: the epic, neon-soaked, über-futuristic video for "Derezzed." Check it out below! The video is a perfect synthesis of the original Tron's old school, eight-bit sensibility and the sequel's cutting edge 3-D technologies. "Derezzed" kicks off with Daft Punk's Guy-Manuel de Homem-Christo and Thomas Bangalter (in a rare filmed appearance) strolling into Flynn's Arcade (which figures in the original movie) and firing up a dusty Derezzed video game console. Daft Punk then assume the roles of the movie's main characters (played by Garrett Hedlund and Olivia Wilde in the new film) and engage in a fierce jousting battle atop the movie's iconic light-cycles. Hot! 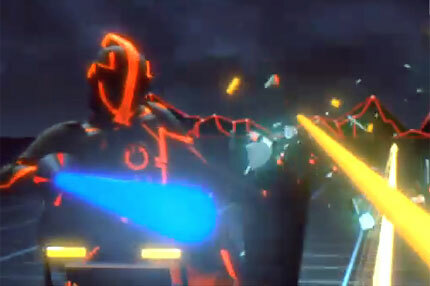 What do you think of Daft Punk's clip? Sound off in the comments below. Tron: Legacy opens in theaters on December 17.